You can grill the chicken whole, then slice and serve, but skewers are fun for a party. Before you start soak 18 x 25cm wooden skewers in water for 1 hour. Holding the knife at an angle to the breast, cut the chicken into slices about 1cm thick and place in a bowl. Mix all the marinade ingredients together, add to the chicken and toss lightly to coat. Cover with plastic wrap, and chill for 30 minutes or longer. Drain the skewers and thread the chicken slices on so they lie flat. In a blender or a food processor, purée the satay sauce ingredients until smooth. Pour into a serving dish. Preheat the grill and brush the grill pan with the olive oil. (Alternatively, heat a heavy frying pan or griddle pan, add a teaspoon of oil and heat until near smoking.) Remove the chicken skewers from the marinade, shake off any excess and grill or fry for 4-6 minutes each side, depending on the thickness. Arrange the cooked chicken on a platter and sprinkle coriander on top, if using. 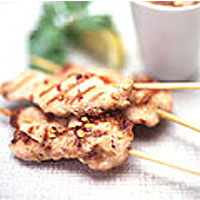 To serve, spoon some of the satay sauce on each portion and eat.